The three machine farm had an installed capacity of 2.25MW (3x750kW). Each machine was 120m long and 3.5m in diameter and comprised four tube sections linked by three, shorter, power conversion modules. Testing of this array proved the speedy installation concepts, developed team experience, maintained safe conditions, and that power generation and behaviour was matched with numerical models. 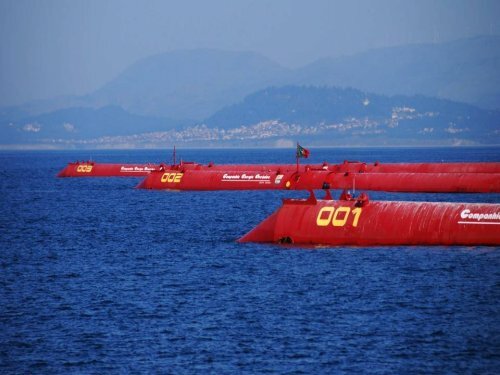 The devices were located off the northern Portuguese coast in the Atlantic Ocean, near Póvoa do Varzim, in 50 metres of water depth. Three machines were installed and operated in July 2008, generating sustained power to the grid with close agreement to the Pelamis simulations. However, the project ended earlier than planned, with the three machines returning to harbour, due the financial collapse of Enersis’s parent company, Babcock & Brown. The machines were operating from July to November 2008. The licensing process of the small farm was concluded in 2006 and followed the existing national legislation (DL 254/99) for offshore operation license which had to be undersigned by 5 ministers. The process was relatively fast since the project was considered positively by the government. Although not explicitly demanded at that time, an EIA was done for the small park. An Environmental Impact Assessment has been carried out prior to the project installation. Monitoring activities have been performed during the operation period. Due to the short operation period the monitoring results were inconclusive regarding the devices’ effects on the environment. Nevertheless, two years of environmental baseline studies have been carried out. The Environmental Impact Statement developed before the devices were installed pointed devices’ noise, electromagnetic fields and habitat alteration as the main negative impacts and the “artificial reef” and “sanctuary” effects as positive ones. Companhia da Energia Oceânica SA (CEO) - Aguçadoura is located in Portugal. About two years (from November 2007 to January 2010) of baseline studies. Three sampling stations, parallel to the coast line, were defined distancing each other about 2 km: the impacted zone (where the devices were supposed to be installed) and two control zones. Analysis of communities structure and composition. Samples were collected each three months. High biodiversity presenting a good level of conservation. High temporal variability. Analysis of populations’ structure and composition. Samples were collected each two months. High number of commercial species presenting a moderate level of conservation. High temporal variability. Analysis of species composition and distribution. About three months of (from July to November 2008) of monitoring studies. Three sampling stations were defined: the impacted zone (where the devices were installed) and two control zones. Analysis of invertebrate colonisation on the equipment was analysed. Due to the short operation period the monitoring results were considered inconclusive regarding the devices’ effects on the environment. Pelagic fish aggregation around the devices was analysed. Visual observations by boat to analyse changes on marine mammal behaviour and distribution.